WASHINGTON D.C. – More than 216,000 homicides committed since 1980 remain unsolved – a body count greater than the population of Des Moines, Iowa. That figure is not readily apparent in the U.S. Department of Justice’s annual estimate of killings considered cleared through arrest, but a little digging by the Murder Accountability Project revealed it. The bottom line: Forget about what you see on the TV crime shows. Murders aren’t solved in 60 minutes by beautiful investigators surrounded by glitzy monitors and high-tech gadgets. 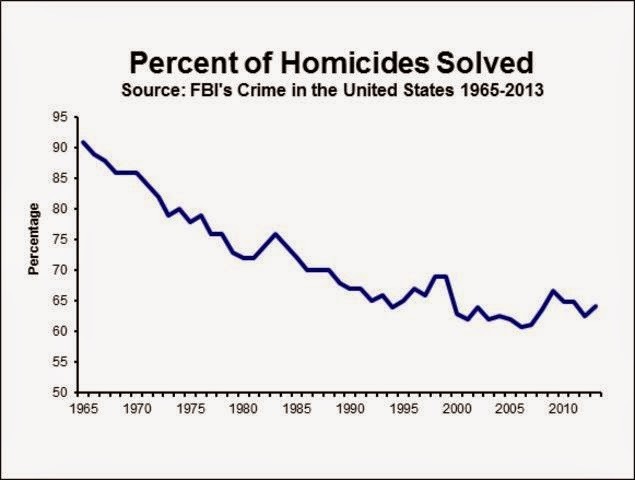 Truth is homicides are less likely to be solved today than they were 40 years ago. Police fail to make an arrest in more than a third of the nation’s murders, resulting in an ever-increasing accumulation of cold cases. Corrado is a homicide investigator in Atlantic City, N.J., which has more than 200 unsolved homicides according to FBI data, including the serial killings of four women found in 2006 in a drainage ditch near the city’s casino district. The women had been strangled or suffocated and left in the ditch over a period of months. “We are still working that case today,” Corrado said. The rates at which homicides are considered cleared – meaning someone was actually arrested and handed over to the courts for trial – have declined alarmingly in America. The FBI estimates that the homicide clearance rate in 2012 was only 64 percent, down from 90 percent reported in 1965 when the government first reported statistics. In many communities, it has become statistically unlikely that a murder will be solved. The Detroit Police Department reported making arrests in only 34 of its 386 homicides in 2012, which is a solution rate of only 9 percent. New Orleans reported solving only 15 percent of its 193 killings that year. Just about every major police department faces a bewildering number of cold cases. Atlanta, Ga., has about 1,800 unsolved cases going back to 1965, while Phoenix, Ariz., has nearly 2,400 and Cleveland, Ohio, has about 2,100 unresolved killings still on the books. Although the total number and the rate of murder have both declined since the 1990s – when killings peaked at nearly 24,000 a year – the remaining 14,000 or so committed in recent years tend to be more difficult to solve. Crimes of passion have declined as courts have taken more aggressive action in domestic violence cases. But gang- and drug-related homicides continue and are much more difficult to solve because witnesses are reluctant to challenge organized crime. Some police departments in recent years have stopped reporting to the FBI how many homicide arrests they make each year, making it impossible to know exactly how many cold cases are still on the books. Among these non-reporting departments are New York City, Chicago and Gary, Indiana, where police recently arrested a suspected serial killer who said he’d been active since the mid-1990s. The Murder Accountability Project calculated the number of cold cases across the country by using the U.S. Department of Justice’s annual estimate for the percentage of killings that are cleared through arrest, taking the remainder of that figure (the percentage that aren’t solved) and multiplying it against the federal estimate for total homicides committed each year.